The future of manufacturing is a topic of enduring interest. There are many questions that need to be answered to determine what the manufacturing sector will look like in the twenty-first century and where it will be located. One of the key questions is the competitiveness of labor: it is still the case that manufacturing—particularly of goods such as textiles, shoes, and light electronics—is driven by the wage level. It is always risky to speculate on the future, especially considering evolving trends in technology which will shape the evolution of comparative and absolute advantage in manufacturing. However, a new paper coauthored by Alan Gelb, Christian Meyer, Divyanshi Wadhwa, and myself suggests that Africa is not, in general, poised to embark on a manufacturing-led take-off, stepping into the shoes of emerging Asia. 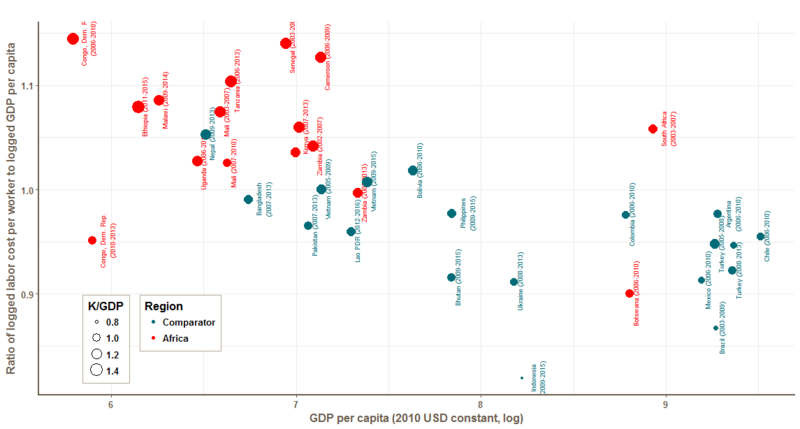 Africa, including those countries that have come to be regarded as leaders in development, has high manufacturing labor costs relative to GDP as well as high capital costs relative to low-income comparators. Using a newly-constructed panel of firm-level data from the World Bank’s Enterprise Surveys, we look at labor costs in a range of low and middle income countries in sub-Saharan Africa. We then compare these with labor costs in low-cost countries outside of Africa such as Bangladesh as well as a wide range of other countries. We estimate labor costs—both actual and hypothetical: What would labor costs for sub-Saharan African firms look like if they were located outside of Africa? What would Bangladesh's labor costs be if it was located on the African continent? Our results suggest that for any given level of GDP, labor is more costly for firms located in sub-Saharan Africa. Breaking “Africa” down into sub-groups suggests a more nuanced picture. Within the sample Ethiopia stands out as distinctive—its costs appear to be low and it has attracted a significant amount of foreign investment by companies such as H&M, DBL Group, and Hujian International over the past few years. Our results suggest that businesses currently based in Asia may pass over middle income Africa to find a landing place in the poorest countries, provided that these countries can provide a stable platform for industrial production. Our results suggest further avenues of research. We do not fully understand the factors behind prices and costs, whether for industrial labor or, more generally, in terms of purchasing-power parity price levels, and why so many African countries appear to be costly relative to their income levels. It would also be useful to understand better the determinants of industrial investment and development in the poorest countries where carefully designed industrial policy can possibly unleash the potential for manufacturing and rapid industrialization, as well as the impact on living standards.